The Diamond Sutra, a Buddhist scripture, was the first dated example of block printing. Bi Sheng in China invented movable clay type. Europeans use xylography (art of engraving on wood, block printing) to produce books. Gutenberg moved from his native town of Mainz to Strasburg. 1437 Gutenberg was sued for "breach of promise of marriage" by a young lady of Strasburg. 1440 Laurens Janszoon Koster (Coster) is credited, by some, with inventing movable metal type. 1444 Gutenberg returns to Mainz and sets up a printing shop. 1446 Gutenberg prints the "Poem of the Last Judgment". 1448 Gutenberg prints the "Calendar for 1448". 1450 Gutenberg' formed a partnership with the wealthy Johann Fust. 1454 Gutenberg prints indulgences (notes sold to Christians by the Pope, pardoning their sins). 1455 Gutenberg completed work on what is estimated to be 200 copies of the Bible. 1455 Gutenberg was effectively bankrupt. Investor Johann Faust gains control of print business. 1460 Gutenberg reestablished himself in the printing business with the aid of Conrad Humery. 1461 Albrecht Pfister printed the first illustrated book Edelstein which featured a number of woodcuts. 1465 Gutenberg is appointed to the court of Archbishop Adolf of Nassau. Two hundred woodcuts were used in a edition of Aesop's Fables. The first book printed was the Bible. They carved large wooden panels in order to print each page. It was invented in 1500. 1476 First use of copper engravings instead of woodcuts for illustration. 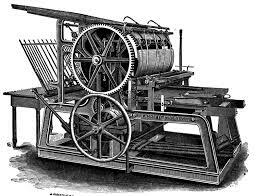 1476 William Caxton sets up his printing press in Westminster, England. Printing had become established in more than 2500 cities around Europe. An estimated 15 million books have been press printed, representing thirty thousand book titles.